To start, launch Xcode and create a new project by going to File > New Project. Under the iPhone OS section of the New Project window select View-Based Application. We’re going to start with creating the UI. iPhone applications use files called xib or nib files to help separate the coding from the design. To open the default xib file select the Resources folder on the left menu, and open HelloWorldViewController.xib. This should open Interface Builder. 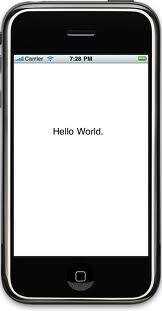 If you save this by pressing Command+S and then go back to your Xcode window and press Command+Enter you can run the application in the iPhone simulator. This application shows up, but nothing actually happens. Clicking on the UITextField will open the keyboard, but nothing happens when you press return. Now lets get back to coding! In order to hook these UI elements up to the code we need to have a representation of these items in the code. This representation has to be created manually, and Interface Builder helps you out just a little bit in creating these connections. To do this click on the File’s Owner object in the HelloWorldViewController.xib window. Notice that this object is of type HelloWorldViewController. This is the main class of your application. In Xcode you can see this class file in the Classes folder, and this will be where we write all of our code. With the File’s Owner object selected, go to Tools > Identity Inspector. In the Identity Inspector you’ll see that the object class is HelloWorldViewController, and you’ll see two more sections indicating Actions and Outlets. Actions are required in order to hook up events, such as a button’s click event which we’ll cover in just a minute. Outlets are the connections used to hook up the UI elements to the code. So we’re going to need one Action for the button click, and then three Outlets, one for each UI element. In the Action section simply click the plus sign and enter a new Action name – lets call it “TextReset”. In the Outlets section you’re going to add three outlets – let’s call them MyLabel, MyTextField and MyButton. When you’ve finished with that we need to write these new outlets and actions into the code file. To do this we need to go to File > Write Class Files… then click Save. Click Merge. Now a file merging utility, appropriately named “FileMerge” will pop up. The file you seen on the left is the new file that you’ve created with Interface Builder, and the file you currently have in Xcode is on the right. Each arrow seen in the center corresponds to a conflict between the two files. You’re going to want to make the arrows point to the file on the left. Do this by clicking the left arrow on the keyboard. Navigate through the merges by using the up and down arrows on the keyboard. When you’ve made both arrows point to the left press Command+W to close the window. Click Save when it prompts you. Repeat this for the second file. Now we have successfully declared our handles for the UI elements that we created in Interface Builder. In our actual code file, the HelloWorldViewController.m file, we have the actual code that will make the application run. You might see a lot of green commented out functions here. These are standard methods that are often used and are only there to make it easier for you to get started. We’re not going to need to touch them so pay them no mind. Good. There’s one more function we need to write in this file, but for now lets go back to Interface Builder and hook up the UI elements to the code. Back in interface builder we want to connect everything to the code. To do this we need to click on the File’s Owner object and go to Tools > Connections Inspector. In the Connections Inspector you should see MyLabel, MyTextField, and MyButton in the Outlets section. Click on the circle on the right side of the title of each of these items in the Connections Inspector and drag the mouse over to the item that you want to connect this outlet to. In the Connections Inspector you’ll also see an Actions section with an item in it called “TextReset.” Drag from the circle of this item to the UIButton and a dialog will appear – this dialog shows you all the different events on the button that this Action can be tied to. We want to select the Touch Up Inside event. Lets run the application real quick. Save your changes in Interface Builder by clicking Command+S. Go to Xcode and press Command+Enter. Once the application loads up in the iPhone Simulator, select the TextField. A Keyboard pops up! Try typing something in and pressing return. Nothing happens. This is because we haven’t told it what to do yet. In order to communicate with the keyboard we need to mark our HelloWorldViewController as the delegate that the Keyboard will talk to. This delegate must follow and implement the UITextFieldDelegate, which we’ll add now. Now, if you hold the option button down and double click on the text “UITextFieldDelegate” in Xcode it will take you to the documentation for that class. Looking through it we could find out that we want to implement the “textFieldShouldReturn:” method. So lets go ahead and do that. Here we first check to see if the input parameter “theTextField” that the keyboard is attached to is in fact the same text field as MyTextField (this would be important if there were more than one text field in the View). If it is the same text field then we tell our text field to resign its first responder. This means that it’s going to resign its status as the focused element, resulting in the keyboard going away. We also want to make sure we update the text – that’s the point of the app! Returning YES means that we want to implement the default text field behavior for pressing return on the keyboard. One last thing before we’re done – in order for the keyboard to know that HelloWorldViewController is implementing the UITextFieldDelegate we need to tell it such. We do this by going into Interface Builder and selecting the UITextField. In the Connections Inspector you’ll see that the UITextField has an Outlet titled “delegate” – drag this to the File’s Owner object in the HelloWoldViewController.xib window. Go back to Xcode and press Command+Enter.